I recently started making a new alphabet book for Hailey. This is a really simple way to practice letters. Just squirt some finger paint onto a plate. Enjoy playing with the finger paint- write words, letters, numbers. Draw pictures or just play with it. 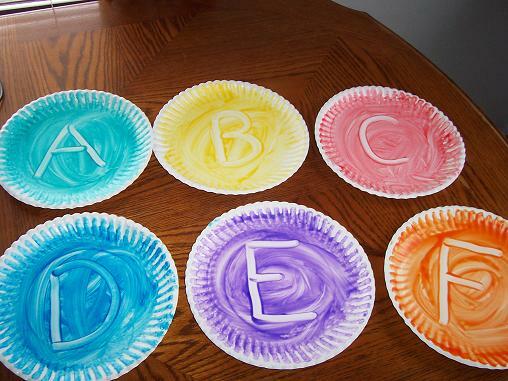 Then when your child is done playing with the paint you can write the letter you want to be on the plate when it dries. Once the plates are dry you can put them together to make a book. Hailey loves her book! 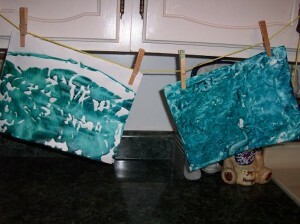 For toddlers painting (or any “art” activity) is all about the process. Toddlers don’t care much about what they are making, so long as they are having fun making it. 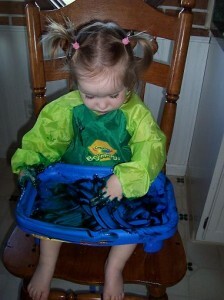 Finger painting is a great activity to do with toddlers. Most of them love getting messy (although some do not like it and that is perfectly normal too). And they are curious about how it feels. 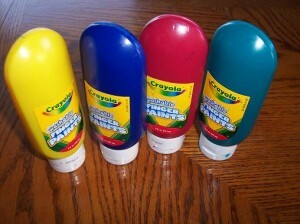 It’s great for talking about colors and for mixing primary colors together to see what happens. This activity for finger painting is perfect for toddlers- or anyone really. Put some finger paint on the highchair or table and let your toddler paint the table. Hailey loved painting her tray. When she was done I took a piece of paper and and pressed it onto her painting- a way to save the painting she had done. The finished pictures, hanging to dry. In a large saucepan, combine the first nine ingredients; bring to a boil. 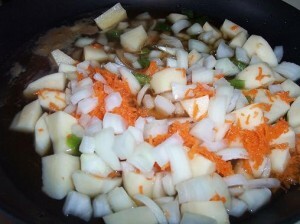 Reduce heat; cover and simmer for 15-20 minutes or until potatoes are tender. Stir in beef and 2 cups of milk; heat through. Combine flour and remaining milk until smooth; gradually stir into soup. Bring to a boil; cook and stir for 2 minutes or until thickened and bubbly. Reduce heat; stir in cheese until melted. Add cayenne if desired. 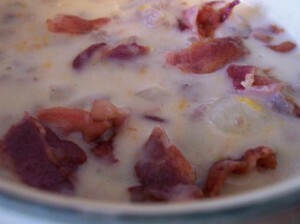 Top with bacon just before serving. Yield: 6-8 servings (about 2 quarts). Stir in beef and 2 cups of milk; heat through. Combine flour and remaining milk until smooth; gradually stir into soup. Bring to a boil; cook and stir for 2 minutes or until thickened and bubbly. Reduce heat; stir in cheese until melted. 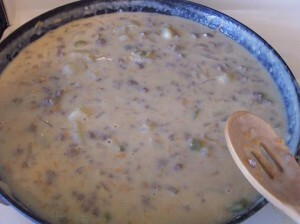 The finished product- a yummy cup of Spicy Cheeseburger Soup.